Above, Horyuji Temple in Nara, Japan, the world's oldest wooden structure and evidence of the Tang Dynasty's international influence. From 618 to 907, a glittering superpower ruled over a vast territory from China's east coast to the Middle East, wielding its influence from the most populous and cosmopolitan city in the world, Changan, China. The Tang dynasty commanded armies of hundreds of thousands of soldiers who dominated lucrative central Asian trade routes along the Silk Road to Persia, further west than any previous Chinese dynasty had reached. The Tang also maintained maritime routes to the Middle East and Horn of Africa and east and southeast Asia, bringing goods into Changan (near present-day Xian, China) from as far away as Rome. Tang rulers exercised direct power over foreign kingdoms and states under a tributary system, while Tang civilization had a deep and lasting cultural influence over an even wider sphere that included Japan, Korea and Vietnam. The culturally mixed rulers who presided over this golden age of Chinese history were among the most open and culturally tolerant in China’s history, sporting Turkic clothing, welcoming foreigners to their capital and allowing women to acquire an education, own land, conduct business and divorce. A woman, the Empress Wu Zetian, ruled this empire for more than half a century. Tang rulers instituted lasting reforms such as civil service examinations to recruit officials instead of relying on nobility for those positions. Woodblock printing was developed. Buddhism became a major influence while other religions were tolerated in major urban centers. The Tang built a resplendent walled capital at Changan with a royal palace in the north. A wide central avenue running north and south connected the main southern city gate with the palace, a pattern that later persisted for more than a millennia in Chinese and other Asian capitals. Changan was famed for its square checkerboard pattern created by main streets running east and west and north and south. The city had large Buddhist and Daoist monasteries, churches and flourishing universities to which foreigners flocked to study. Scholars compiled encyclopedias and histories and produced versions of the classics that were taken home by foreign scholars to become influential in cultures all over Asia. Painting, music and literature flourished and likewise spread. Chinese production centers produced ceramics, silk, silver and gold for overseas markets. Thousands of foreign merchants lived in Chinese port cities where foreign ships docked with cargoes of spices, pearls and jade. Far away in the Middle East, merchants acted as middlemen for a flourishing indirect trade between China and Europe. No foreign country was more involved in Tang China than the Japanese, who before the Tang dynasty already had some contact with the Chinese. Japan was in a period of significant political, social and cultural change. the island country had a strong aristocracy of powerful clans, often warring rivals of each other. This period was the first time in Japanese history when the emperor managed to rule relatively uncontested by the aristocracy. In search of a way to strengthen the central government and break the power of the Shinto clans, the imperial court adopted Buddhism as the state religion not long before the rise of the Tang dynasty. During the Tang, the Japanese imperial court looked to China as its governmental and cultural model. Borrowing from China took on even greater momentum in 663, after Japanese forces were defeated on the Korean peninsula by a allied force from the Korean kingdom of Silla and Tang China. The Japanese lost 200 ships and absorbed the lesson that they needed to acquire technology and strategic knowledge from the Chinese. Over the next two decades, Japan dispatched more than a dozen diplomatic missions that included hundreds of diplomats, students, scholars, monks, architects and artisans to China to study the Tang. They brought back to Japan books, documents, building plans, construction paintings and cultural artifacts. At home, they eagerly adopted Chinese practices. Artisans imparted from China and Korea helped build Chinese-style temples, mansions and gardens in Japan. The foreign artisans worked with local carpenters in a master-apprentice system that continued in Japan into modern times. Senior Japanese ministers who had studied in China or were descendants of Japanese sent to China created a law code, Japan’s oldest, inspired by the Tang legal code. Japanese literary and artistic works from poems to paintings and court music were deeply influenced by Tang styles, symbols and Buddhism and Taoism from China. The Japanese recorded their history and activities using Chinese cursive writing. They built their capitol cities, first at Nara and later at Heian-kyo (present-day Kyoto), on the model of Changan. The practice of borrowing from China reached its height from 710 to 894, with varying success because Japan’s central government never succeeded in dominating aristocrats as the Chinese emperors did. Chinese-style temples built in Nara during the Tang era still stand, preserving Tang-style wooden architecture while in China proper, there are no extant Tang-era wooden buildings. In China, Tang buildings were ravaged by fire, earthquakes, wars, religious persecutions and finally 19th and 20th century development. Meanwhile in Nara, the Tang-era Horyuji temple which contains the world’s oldest wooden structures and the Todaiji temple survived, partly by luck in avoiding the ravages of war, partly because they were carefully preserved and restored over the centuries and partly because they were made of extremely durable Japanese hinoki cypress trees. A covered corridor in the Horyuji temple. The hinoki cypress columns, beams and other wooden parts that make up the Horyuji ‘s central gate, main hall and a five-story pagoda account for the building’s longevity. 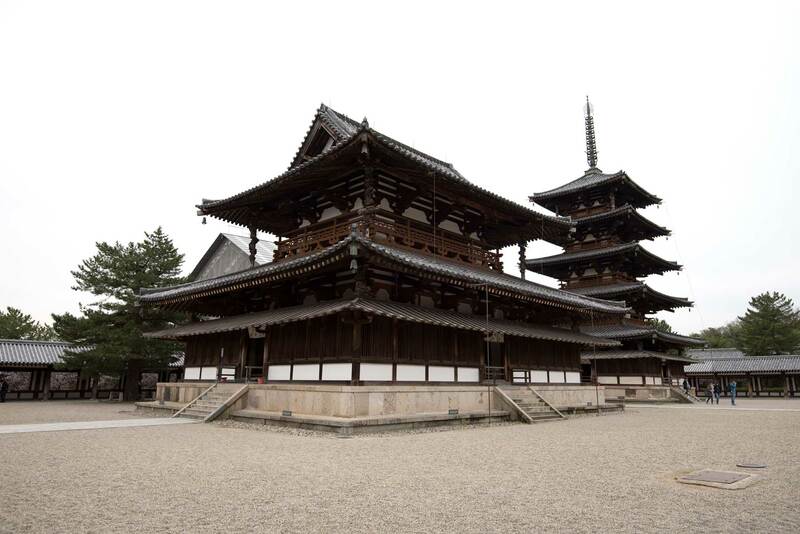 Although the temple has been restored several times, 65 percent of the wood in it is original. Hinoki cypress is considered sacred in Japan. Mostly composed of durable heartwood with only a small percentage of more perishable and rot-prone sapwood, a hinoki tree actually continues to become more durable for about 200 years after it is cut. After that, it slowly returns to its original durability over a period of about 1000 years. For this reason, Japanese carpenters say that the cypress has two lives, one before it is cut and one after. The fresh scent of cypress can be detected on the 1,300 year-old hinoki timbers. It is not certain where in Japan the wood came from. Some of it may have been local and some may have come from distant mountains, which made the transport of the massive timbers an immense undertaking. Those that came from a long distance are believed to have been felled and then floated down rivers and hauled overland to the temple sites. 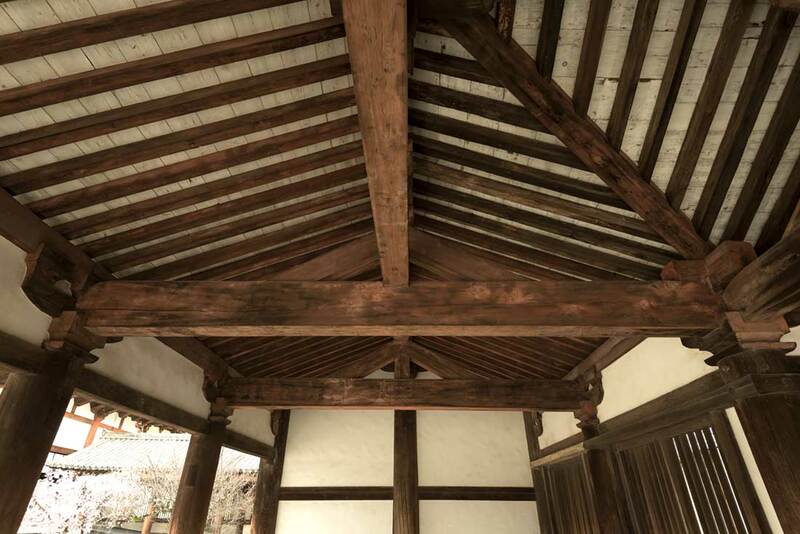 The skill required to construct the post-and-beam halls, with their complex curved roof supports, is one of the forces that gave rise to the superb knowledge of wood and precision of traditional master carpenters in Japan. Another impetus, which came much later, was the declining supply of the slow-growing hinoki, which forced carpenters to splice together smaller timbers in joints that have become the hallmarks of Japanese carpentry. By a strange twist of history and environmental conditions, the Horyuji and Todaiji temples in Nara became the repository of collections of Tang-era treasures from China and locations along the Silk Road, some of which are unlike any artifacts that still exist in China today. The temples housed these treasures in hinoki cypress shoso or treasure houses, the most famous of which are part of the Todaiji and Horyuji temples. These treasure houses were constructed so that they could “breathe,” with humidity exiting the buildings when the environment was dry and returning when it was more humid to form a stable environment in the interiors of the buildings. Combined with the wooden chests in which the treasures were stored, the buildings created an environment that allowed the artifacts to survive in mint condition. The conditions were ideal for long-term storage of silks, paintings, scrolls and other perishable items. Horyuji's treasure house. Many of its treasures from the Tang era and later are now housed in a museum nearby. Today, Chinese flock to Nara and Kyoto by the hundreds of thousands to see architecture and artifacts from the Tang era, considered China’s golden age, that modern China with its high-rise apartments, malls and highways has not preserved. 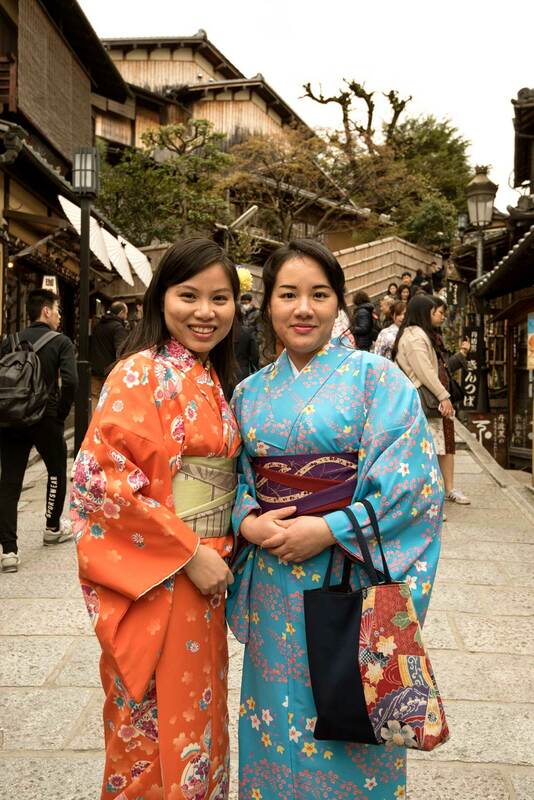 Many Chinese tourists don rented kimonos, the Japanese national costume which derived from Tang fashion, to stroll through temples and along traditional Kyoto streets imagining what life was like in Tang China. Chinese tourists in kimonos on a traditional street in Kyoto, Japan. During part of Japan’s Asuka period (538-710), Japanese clothing was closely modeled on Tang fashions and Tang clothing continued to influence Japanese clothing in the Nara period (710-794). The Japanese government imposed laws in 701 and 718 dictating the clothing that should be worn for high ceremonies, mourning and uniforms. Collars had to be crossed left over right and women in the court wore colored, multi-layered crossed robes. The various layers were arranged to show all of the layers at the sleeves, neck and hems. These robes are still worn for the Imperial Enthronement Ceremony and royal weddings. Skirts that were worn over robes in Tang China were abandoned in Japan during the Nara period, leaving only a vestigial garment worn in the back of a woman’s costume. 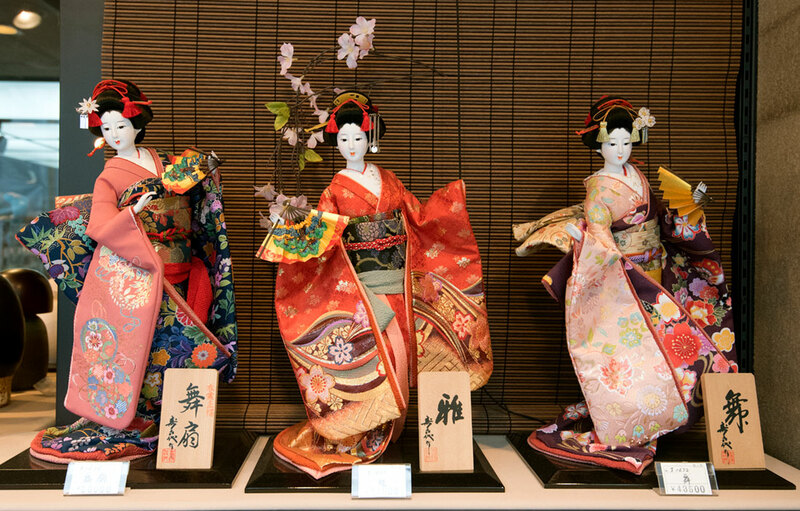 Japanese dolls in layered kimonos in a shop in Kyoto. The kimono has become the most well-known symbol of Japan. A Tang-era painting shows women in dresses silk dresses with long sleeves similar to the kimono. 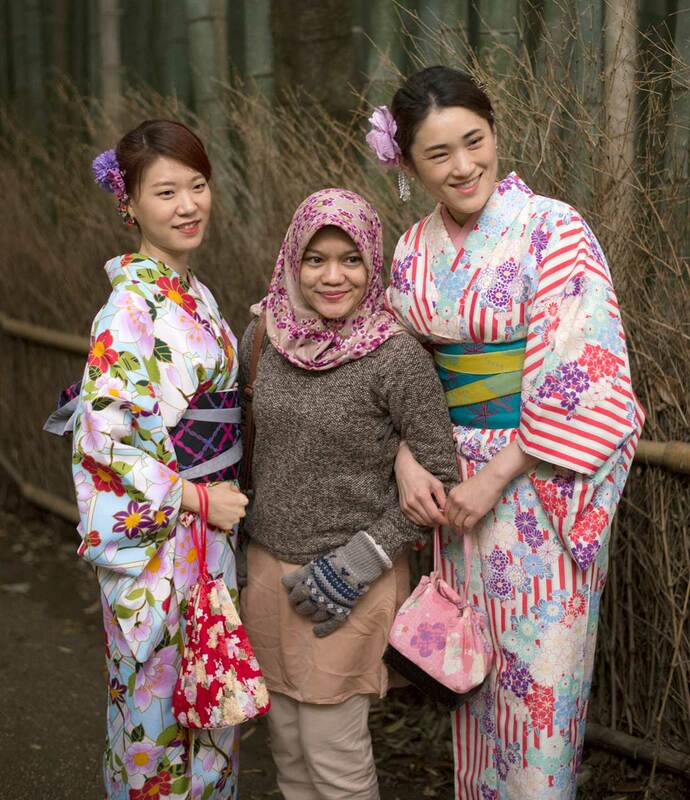 Two tourists pose in kimonos with a a woman in a hijab, a modern-day version of intercultural exchanges at the eastern terminous of the Silk Road in Kyoto, Japan. The most well-known segment of Japanese society to wear kimonos and elaborate hairstyles are the geishas, who are rigorously trained in the type of rituals and entertainment that once were popular in the imperial court in Japan. 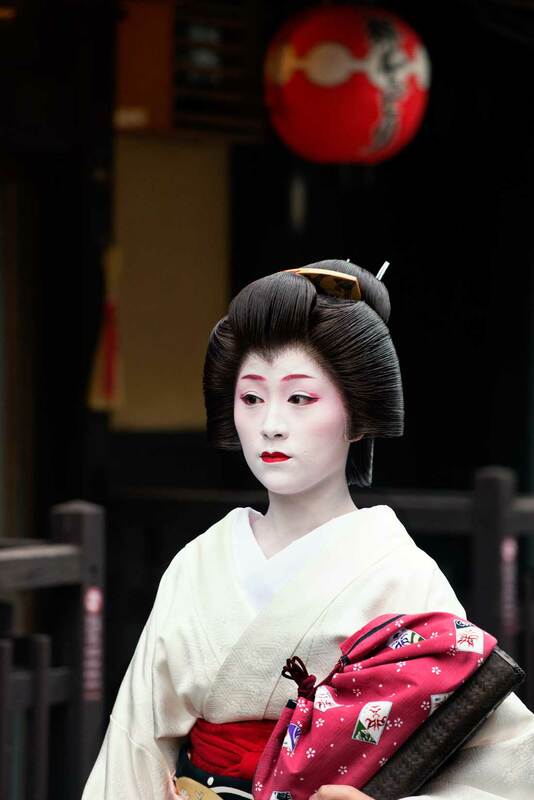 This geisha is heading to work in Kyoto. As in China, clothing indicated rank, age, marital status and regional location, so it became fraught with symbolic meaning. As time went on, the clothing developed into the kimono. Court clothing, court rituals and ceremonies, music and dances still used in Japan are based on Tang models that survived and were developed in Japan while being replaced by other fashions in China. The decline of the Tang in China coincided with the Japanese capital being moved from Nara to Kyoto. As the Tang declined, so did Japan’s cultural borrowing from China. China and Japan went in different directions. 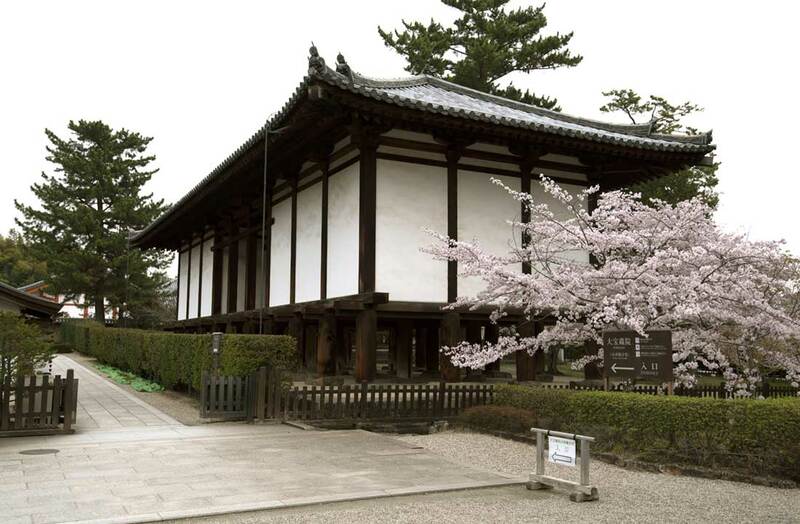 Although the Horyuji is one of the best examples of Tang-era architecture and was an attempt by Prince Shotoku to establish Buddhism as Japan’s state, the temple also has among the best examples of graveled courtyards in the style of Shinto shrines, a feature not generally found in Chinese temples. The original layout of the temple was symmetrical in the Chinese style and had a main gate, pagoda, Buddha hall and lecture hall in a straight line running from north to south. At one point the pagoda was destroyed and was rebuilt a few years later to the left of the main hall, which broke the Chinese style symmetry of the layout and reflected the Japanese propensity for asymmetry. Another octagonal hall, the Yume-dono or Hall of Dreams was built in 739 on the former site of Prince Shotoku’s private palace to the east of the main hall. The Japanese also allowed the original Chinese-style vermillion paint to weather away, giving the building its quintessential Japanese flavor of bare finely crafted wood. Donna Rouviere Anderson is writing a book about Chinese architecture and beliefs.